It was at the 2014 Tour Down Under that medical tech company Rhinomed first revealed The Turbine, a “nasal dilator” that allowed athletes to breathe more easily by stenting the nose. The claim was that by making breathing more efficient, cyclists would have more energy to spend on turning the pedals. As a result, Rhinomed claimed, The Turbine would lead to an improvement in rider performance. The device attracted its fair share of criticism from within the amateur cycling scene, particularly in Australia, with sceptics questioning Rhinomed’s claims of performance enhancement. In August 2014 CyclingTips took a look at how effective The Turbine was and whether the criticisms of the device were warranted. Two years on, a couple of research papers have been published, investigating whether The Turbine does in fact offer the performance gains Rhinomed initially claimed. So what did the researchers discover? And how has Rhinomed’s marketing of The Turbine changed in the past two years? The earliest research trial to investigate The Turbine came out the Australian Catholic University (ACU) and was headed up by Dr Doug Whyte. Dr Whyte and his team worked with seven study participants to test whether an prototype of The Turbine would allow greater power output during a 30-minute time trial and a greater economy of motion; that is, a reduction in the amount of work required for a given effort1. The findings from the study, which were first made public in a conference presentation in October 2014, angered Rhinomed. According to the company, the results were of little value given they were done with an early prototype of The Turbine and with a very small number of participants. “What was surprising about the conclusions reached by Dr Whyte was that he had previously told the company that the data was not reliable,” Rhinomed CEO Michael Johnson told CyclingTips. “This was not surprising as the recruitment and inclusion process was random with even one of the company’s employees at the time being included in the study. This graph from Dr Whyte’s paper shows riders’ average power output for each five-minute block of the two 30-minute time trials. The white column shows the use of the nasal dilator; the black column is without. Plans to publish Dr Whyte’s findings were initially held up by legal discussions between Rhinomed and the ACU but the paper eventually went to print in the July-August 2016 edition of the Journal of Sports Medicine and Physical Fitness. The second of the two papers published about The Turbine came out of Murdoch University in Perth, Western Australia and was published in the Journal of Science and Medicine in Sport in August 2016. 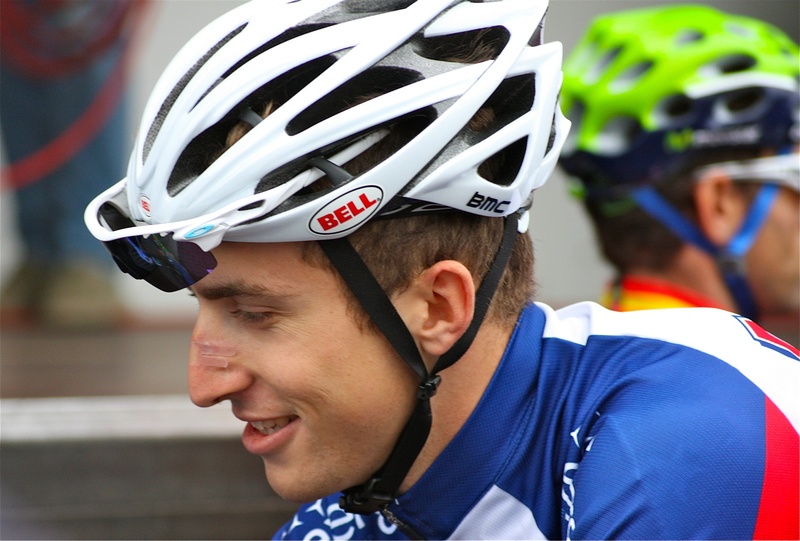 After securing funding from Rhinomed for the study3, lead author Dr Jeremiah Peiffer and his team recruited 15 trained cyclists with time-trialling experience to test whether the “extra air” provided by The Turbine and Breathe Right nasal strips would translate to a performance benefit. The participants did a total of four, 20km time trials over a period of several weeks. The first trial was used to collect baseline data and familiarise the riders with the experiment setup. In the remaining trials they repeated the same 20km effort, collecting data from three different setups: riding with no breathing device, using the nasal strips, and using The Turbine. Peiffer and his team’s first finding was that there was no changes to the economy of motion; that riders had to work just as hard for a given power output regardless of whether their nose was stented and which device was used. The study also revealed that there was no significant difference in the completion times recorded between the three time trials. That is, that using The Turbine (and likewise the Breathe Right strips) didn’t improve the riders’ time trial performance. “The test we used, being a 20km time trial, is a very reliable test which means it usually can be completed within 1% of itself,” Dr Peiffer explained. “That’s important because it means that any changes that are above 1% then would be considered something that would be performance-enhancing. Despite these finding, Dr Peiffer was wary of extrapolating the data beyond what was investigated. “What we’re suggesting is something up to 20km in distance — so that’s about 30 minutes of effort — that [The Turbine and Breathe Right strips] provided zero benefit,” Dr Peiffer said. “Now whether they provide benefit at 40km or to an Ironman triathlete who might be out for nine hours or doing 180km time trial — we can’t really extend these findings to that. Dr Peiffer told CyclingTips he wasn’t overly surprised by the findings. In other words, making it easier to breathe through the nose isn’t hugely important during high-intensity efforts when you’re mainly breathing through your mouth. Dr Peiffer was surprised to learn that The Turbine and the Breathe Right strips didn’t provide a benefit via a placebo effect. Jack Bobridge used The Turbine during his attempt at the hour record in January 2015. The results from Dr Peiffer’s study weren’t what Rhinomed wanted to see, not least given they’d funded the study. But company CEO Michael Johnson told CyclingTips that the news certainly wasn’t all bad. “Sure. We would have liked to see a positive outcome,” he said. “But foremost we are a data-orientated medical technology company. The reason we undertake this and other trials is to gather data that informs our decision-making and also helps drive our innovation programs. Given Rhinomed’s previous marketing efforts for The Turbine, it seems reasonable to suggest the company wouldn’t have had the same qualms with the sample size of the Murdoch study had the results been in its favour. In the early days of The Turbine, Rhinomed marketed the product with an emphasis on the potential performance enhancements it could provide. This followed a trial of nine athletes organised by former Olympian Rob Crowe and his Ridewiser business which suggested that using The Turbine could increase a rider’s power output by up to 6%. Rhinomed no longer makes those claims. Michael Johnson told CyclingTips that this is because the Ridewiser trial wasn’t a robust-enough experiment. Sceptics of The Turbine will likely be unsatisfied with this explanation, given that’s exactly what Rhinomed did claim for a time. Nowadays, Rhinomed focuses on the fact that The Turbine provides “38% more air”, spruiking the associated benefits for those with breathing difficulties, rather than for cyclists who are looking for a performance edge. “What has become very apparent over the last 24 months since we launched the Turbine and in particular since we released version 2 of the product, is that people who have nasal obstruction and/or congestion reported a much more significant benefit,” Johnson said. “This is a real opportunity for us and one we think is pretty exciting. While Rhinomed might have stepped away from claims of increased power output for Turbine users, it hasn’t abandoned the performance cycling market entirely. It still relies on celebrity endorsements, paying professional athletes to wear its product. Chief among them is three-time Tour de France winner Chris Froome. While sceptics will be unconvinced by Froome’s testimonial, Dr Peiffer believes the impact of celebrity on marketing The Turbine shouldn’t be underestimated. “I think there’s a disconnect between sometimes scientific evidence and perception in the field,” Dr Peiffer said. “So you see athletes wearing this, you see professional athletes wearing these things, and I reckon, to be honest, that will have a much bigger impact than this study’s outcomes. “I think someone that sees Chris Froome wearing this in the Tour de France is going to think ‘Well, Sky’s all about marginal gains, and this is possibly a marginal gain I might grab from this’. And when I talk about marginal gains, you could be looking at changes of less than .3 of a percentile being the difference between winning and losing, and Sky’s made an entire business model around that. While The Turbine hasn’t taken off in the amateur racing scene like Rhinomed might have hoped, there are certainly those that use the device. But with two studies now showing that the device doesn’t seem to improve performance — at least for the durations investigated — it will be interesting to see what becomes of The Turbine. Will some riders continue using The Turbine, hoping for a potential edge of a couple of percent? Or will the device prove of use only to those with breathing difficulties? And what of Rhinomed’s shift in marketing focus from The Turbine to the Mute, a similar product designed to prevent snoring? All of these questions remain as-yet unanswered. But the final word belongs to Dr Jeremiah Peiffer whose research has answered a lot of the initial questions that people had about The Turbine. “The take-home really from the paper we wrote is just this: on average it probably doesn’t help, but it also doesn’t hurt,” Dr Peiffer said. “So if you want to buy these things, if you want to use them — and that includes the Breathe Right strips — then you’re choosing to spend your money on that. 1. The theory is that by making it easier to breathe — by stenting the nose — riders have more energy to spend on the act of cycling. Given this, an effort of fixed intensity should require less energy if stenting the nose does indeed lead to improvements in the economy of motion. “I do not recall ever stating the data were not reliable so cannot really comment on this. We have data to show that the reliability between the familiarization and control trials was well within the normal limits for this type of testing but I’m not sure if this is what Rhinomed is referring to. “Subjects were recruited for the study through posters posted around campus asking for active cyclists. This is technically not random. One of the subjects was an employee of the company. 3. It’s not unusual in the world of academia for research projects to be funded by those with a vested interest in that which is being investigated. Before starting the trial Dr Peiffer ensured that Rhinomed was committed to the idea of an independent trial.